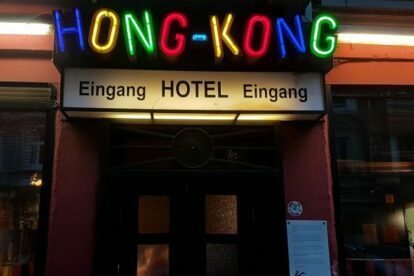 At Hamburger Berg, one of my favorite places is the Hong-Kong Hotel (which my friends and I just call the “Hoteleingang” – “hotel entrance”). On weekends, the Hong-Kong Hotel is packed with people. That might be the case because the beer and shots are very cheap – even for Reeperbahn and Hamburg prices. The signature drink at the Hong-Kong Hotel is “Mexikaner” – a shot consisting of hard alcohol, tomato juice and spices. What may sound weird at first, is actually very good – the possible head ache is worth it! At Hong-Kong Hotel, the guests decide which music they want to hear. A jukebox at the end of the bar is free for all – for a small price you can pick and choose from a vast variety of music. The foosball table in the front part of the bar is also well-frequented. There is nothing better to start a weekend night at Hong-Kong Hotel with a few drinks and good music!